‘I lived the same life as everyone else, the life of ordinary people, the masses.’ Sitting in a prison celI in the autumn of 1944, Hans Fallada sums up his life under the National Socialist dictatorship, the time of ‘inward emigration’. Under conditions of close confinement, in constant fear of discovery, he writes himself free from the nightmare of the Nazi years. His frank and sometimes provocative memoirs were thought for many years to have been lost. They are published here for the first time. The confessional mode did not come naturally to Fallada the writer of fiction, but in the mental and emotional distress of 1944, self -reflection became a survival strategy. In the ‘house of the dead’ he exacts his political revenge on paper. ‘I know that I am crazy. I’m risking not only my own life, I’m also risking the lives of many of the people I am writing about’, he notes, driven by the compulsion to write. And write he does: about spying and denunciation, about the threat to his livelihood and his literary work, about the fate of many friends and contemporaries such as Ernst Rowohlt and Emil Jannings. To conceal his intentions and to save paper, he uses abbreviations. His notes, constantly exposed to the gaze of the prison warders, become a kind of secret code. He finally succeeds in smuggling the manuscript out of the prison, although it remained unpublished for half a century. 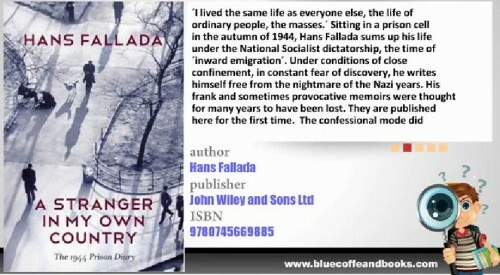 These revealing memoirs by one of the best-known German writers of the 2Oth century will be of great interest to all readers of modern literature.